I can't believe that Christmas is only a few short days away. This year we are way behind on the decor front at our house and are just now putting up all the trimmings to make our house shine with holiday spirt. This year I wanted to find a new wreath to hang above our range hood to add a holiday touch to our newly renovated kitchen. So I searched out a few wreath favs to add to our Top Picks series. If you're interseted I went with Top Pick #1 but all these finds have a fresh spin and the classic holiday staple. There is one bouns to waiting until the last minuet to buy and decorate...SALE prices!! Ha, well better late than never. Let us know what you think about our favs at the moment. And like always if you need helping finding the perfect decor for your home let us know! The saying "The kitchen is the heart of the home" is proven to be true time and time again; and when I meet with new families that are looking to give their home an overhaul this is always a big consideration when it comes to design and layout. There are so many details that go into designing a kitchen. From cabinets, lighting, tile to counter tops. But another important design feature that is sometime overlooked is kitchen seating. Having a place to sit and entertain is always top on clients list. So a great stool is always needed. Not only does it bring function but another dose of perfectly tailored design style. I must say it was hard to only pick a top 4 so I am sure I will be revisiting this subject again! Most stools have the option of either counter height or bar height, so make sure you are selection the perfect height for your counter top. We recommend having about 10" from the bottom of the counter top to the seat of your stool. Also, make sure you give each stool about 28-30" of sitting room. To get the perfect amount of stools for your kitchen, divide the lenght in inches by 30 to get your ideal number of stools. Let us know what you think about our favs at the moment. And like always if you need helping finding the perfect stool to perch on in your kitchen let us know! This spring and summer has been so busy over here, and I can't wait to reveal some of my latest projects-starting with this contemporary Vickery Guest House. My clients had recently moved to a new property and had big plans in mind! They had a large outbuilding and wanted to turn it into a guest house for their friends and family. What a great way to maximize space! With essentially a blank canvas, we went to work and began designing the layout. Because we were working with an existing building the footprint was long and somewhat narrow. With a shotgun layout, I soon learned that it was plenty of space for a roomy guest house, complete with kitchen, full bath, living room, master bedroom, and walk in closet. While interviewing our clients, I discovered that this project was truly a labor of love. They wanted to thank two of their good friends by giving them a place to stay during the summer for an extended period of time. Stepping back from their personal design aesthetic, they handed over the reigns and allowed me to take control of the overall design and gear it toward their friends' more modern preferences. I was so EXCITED to know that they trusted me enough to have the honor of surprising them with this gift and my design work. 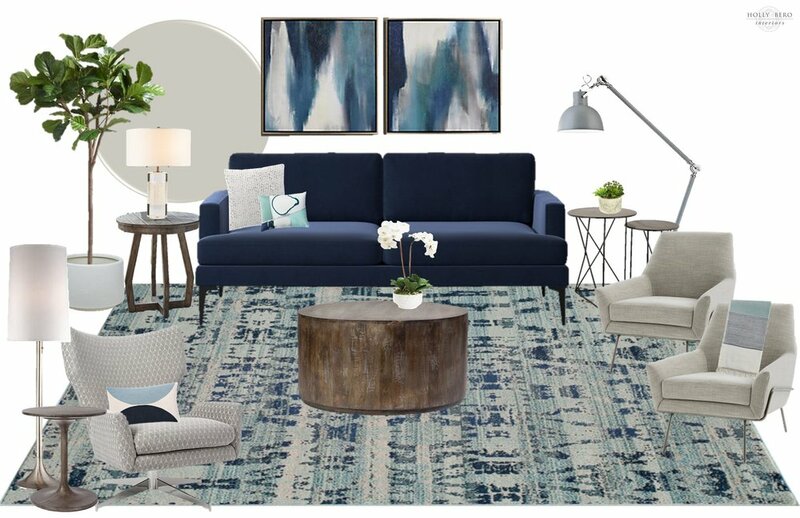 My clients and I decided on a bold color palette full of blues! 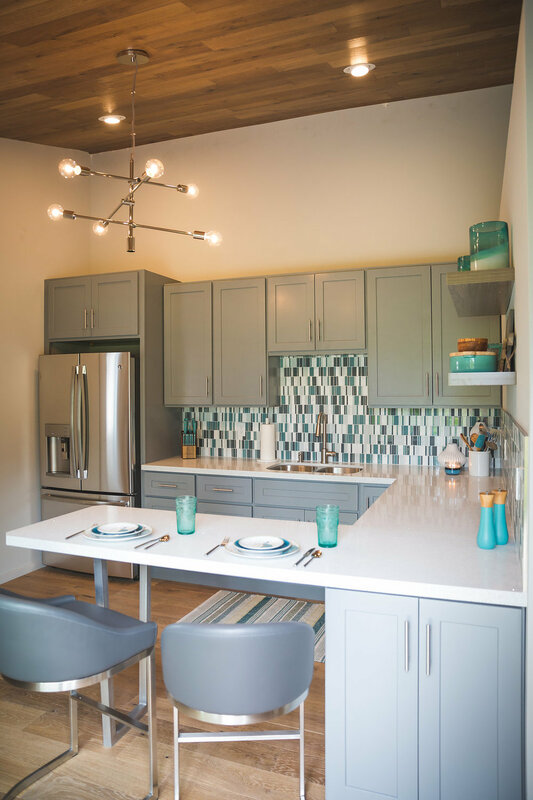 From navy to teal, I incorporated several hues to give the space a fresh and modern appeal. I then filled in the rest of the areas with neutrals and lots of texture to balance the space and add textile interest. I love mixing metallics and finishes. The rustic wood, metal side tables, and contemporary furniture makes for an eclectic mix that is inviting and interesting. Because this space was meant to appeal to many guests, I wanted to bridge the gap between masculine and feminine. 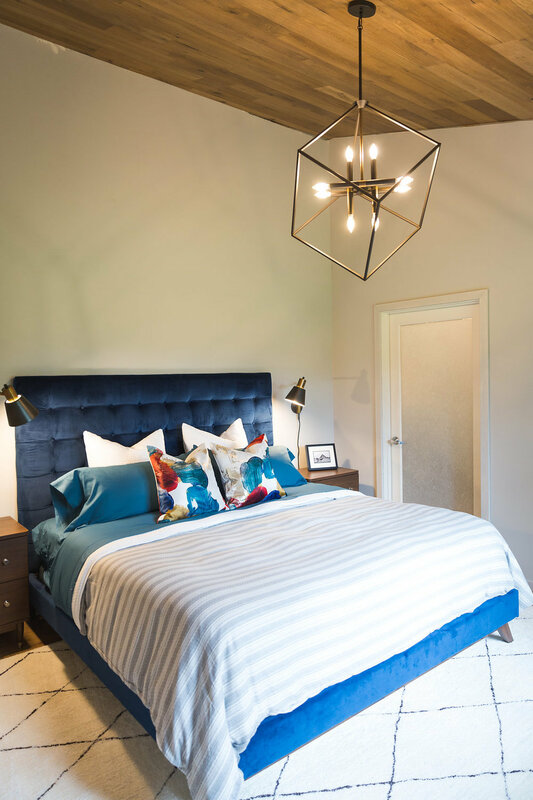 The clean lines of the wood pieces and industrial lighting, paired with the soft upholstered headboard and printed pillows makes for a great balance. The dark navy acts as a neutral along with the off white carpet, making it a great backdrop for the deep red and mustard. Once we had the floor plan decided, I was able to move on to the final selection process. I wanted something bold with lots of personality, since the kitchen is the first thing you see when you enter. I went with a bold gray for the cabinet color. This contrasted nicely with the light quartz counters and allowed us to have a bright kitchen with out being white on white. My clients were learning toward a contemporary look, but nothing too "trendy". I think we hit the nail on the head with this mix of weathered wood, glass mosaic, and chic lighting. WOW! Can we take a moment to admire that amazing ceiling? Not only did we do engineered wood throughout the living areas, but we also carried it overhead to make for a dramatic ceiling treatment. Nothing says the only application is for underfoot...so don't be afraid to think outside the box! This was one of my favorite things about this space and kept it from feeling too modern. I just love the warmth wood brings to any project. We carried the same cabinets, counters, and backsplash into the bathroom for continuity. We then added a simple mirror with more GREAT lighting to give the space it's own identity. Knowing that we wanted to keep the project neutral in style, meaning not too masculine or feminine, we have kept many of the details simple and clean to allow for the accents and art to shine! The Living Room was a great size and we needed to maximize seating. The focal point and inspiration piece for this room was a DREAMY blue velvet sofa. I mean, seriously.... I still can't get over how much I love this! Not going to lie, I have been wanting to use a sofa like this for a project FOREVER, and I finally had the perfect application! I anchored the room with an abstract print rug that was the link between all of our colors. Then, I balanced with space with a pair of great low profile chairs on one side and a large swivel opposite them. The chairs were all neutral with a subtle texture to add warmth and ground the space. To bring the color evenly throughout the space, two large format prints were centered above the sofa, and pillows with throws adorned the chairs. It's always important to keep your eye moving fluidly around the space. By adding color and interest at varying heights, it keeps everyone engaged and connected to the space. The last room was the Master Bedroom. It was placed at the back of the guest house and came complete with it's own walk in closet! What lucky guests! I wanted to continue the color story into the bedroom, but rather than limiting myself ALL blues, I added a mix of warm, intense colors to break things up. The accent pillows and drapery were a brushstroke inspired print and added the PERFECT amount of pop. Also, can we take a moment to admire this headboard! Who doesn't want to lean up against that with coffee and a good book? What a cozy spot to wake up to in the morning. After getting the basics down, I began adding in the layers of accessories and hardware. I have to say, this may be a somewhat small space, but I did not let that stop me from big ideas and statement pieces. Some of my FAVORITE lighting is featured in this master bedroom and the kitchen backsplash would make anyone swoon! Once all of the draperies were hung, and the final accessory was placed, we were left with a space that felt comfortable and inviting, while still having the vibe of an upscale boutique hotel. My clients were thrilled and the reveal was a hit! I can't wait to work with these clients again on their personal home. It is in the early stages of being built, so stay tuned! For more information on this project or to start the conversation about planning your own reno, please contact me. I would love to hear from you! Lighting can make or break a design and when the lighting is on point the whole room shines! But, it can be a daunting task to not only select the best designed light but also pick the appropriately sized light for the space. SO here are some tips along with some our top picks to help you get started! One of my favorite design elements in a kitchen is the island lighting. It is a hands down star and a place where you can have a little fun. I love to use oversized pendant to really capture your eye. Here are four of our top picks for large scale pendants (18" - 24" wide). Small scale (10" - 13") pendant are often used in groupings of 3 or on a smaller scale island. Here are four of our top picks! A couple key pointers to keep in your pocket when it come time to hang those perfect fixtures are: 1. Hanging height should be 36" - 40" from countertop to bottom of pendant. 2. Keep you spacing symmetrical with average distance between pendants at approximately 30" - 32" apart. 3. Use pendant lighting as a secondary light source with primary ceiling lighting around for the perfect balance. If you have any questions over selecting the perfect lighting for your space send them our way! And of course if you have a design project in the works let us know, we'd love to help! Thanks for stopping by and welcome! I am a wife, mommy and interior designer who loves all things beautiful! This is where I share my latest projects, design ideas & tips and the occasional lighthearted post. Wallpaper is making a big come back | Find out how to choose, use and remove.